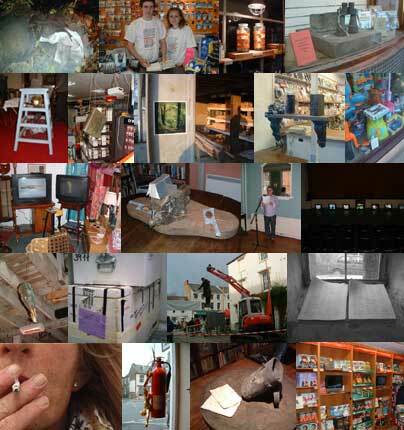 I dipped into ‘countertext’, a collection of installations and events to complement the Bridport Literary Festival, set in businesses and shops throughout Bridport, I wish I had been submerged! What I saw was exciting, inspiring, professional, creative, challenging and emotional, all that art can be. On Saturday for two hours Nigel Slight was suspended in mid-air outside the Arts Centre – ‘Writers Block’ – head down arm outstretched clutching a blank piece of paper a concrete block beneath his feet. He remained perfectly still, not a muscle moved, his gaze fixed, (it must have been tortuous! ), although there was such stillness he emitted such an energy. He was an arresting, thought provoking and powerful sight. Next door at Bridport Old Books were two installations. In the front room I found ‘Soldier’s Verse’, an audio piece by David Rogers accompanying ‘Telegram’ a bronze cast of an empty field glass case by Nigel Slight with a facsimile telegram informing somebody that their loved one had been killed in action. When I put on the headphones a voice roll-calling names from the local war memorial at St. Marys had reached the p’s, “Poole, Prier, Potter …” and with these names sounding in my ears I gazed at the empty field glasses case and the telegram. It was too much, I took them off, too poignant. In the back room was another bronze ‘Alpha and Omega’ by Nigel Slight and ‘With the window wide open’ a soundscape by Joe Stevens. I was intrigued by ‘Jane’s Tiny Table’ by David Rogers, in the window of Country Seats. The simple light coloured table and chair, the jigsaw pieces in piles across the top of the table, the edge pieces joined all ready for completing the middle. No picture jigsaw this one, lots of words, a reversal, the words looked interesting, “Was there a message?” “What did they say?” “Could you go in and play with this jigsaw?” I was on my way to work and had to go but I was left wondering, my curiosity aroused. My dip into ‘countertext’ was evoking so many emotions and at the Electric Palace Cinema, Ed Jones brought laughter and fun. I came across seven television screens and on each screen a different busker playing; one drumming outside his back door, one in a garden under cherry blossom singing, one playing his guitar like a sitar, another playing a saxophone, one on a wall, some with hats on some with hats off, all playing their own favourite song. As you passed each screen close to, you could hear the different individual songs and music and as you stood back the seven pieces of music merged and, in a strange way it worked! Beautifully! It was visually exciting, the sound was interesting and you could change your experience of it by moving around. Then I spotted the busker’s caps at the base of the tv screens! There was quite a lot of money in one! Then two were without their collecting hats, I looked up and realized they were on their heads in the screens, realities mingle! Very clever, effective, uplifting. Any of these installations could sit happily in the Tate in London – or an international gallery for that matter. On Sunday I had more time, I have been meaning to visit the Sladers Yard Gallery in West Bay since it opened, ‘countertext’ moved me onwards. On this journey I have been in awe, I have been near to tears, I’ve laughed and now I was quietly hypnotized and mesmerized, compelled by Charlotte Fleischmann, David Rogers and Richard Mabbs short film “Thank you for not smoking”. Charlotte’s face filled the screen but never as a whole, the camera merciless, just an inch away, if that. In sharpest focus, on her jaw-line, her earring, across her cheek, the pores of her skin. Then to her mouth, her chin and neck, her fingers, the cigarette drawn to her lips, the inhale, the move of sharp focus to her eye, along one side of her nose, I couldn’t stop watching, the camera took you with it, as close as possible, we rarely look at another human being this closely. Then the plume of white smoke rising up across her face, small muscles flinching around dark eyes, freckles, you’re caught, I’m caught, I can’t look away. Whilst parts of Charlotte’s face fill the screen my headphones are filled by a story read by Richard Mabb. Is Charlotte listening to that story? I don’t know, I don’t think so and yet she could be. The cigarette is stubbed out, the coffee has been drunk the story ends, if I smoked I would want to give up. There were many other events I didn’t get to see but all credit to David Rogers and Nigel Slight for masterminding, co-ordinating and creating this wonderful series of events. All credit to the businesses and shops willing to take part and of course to all the artists. 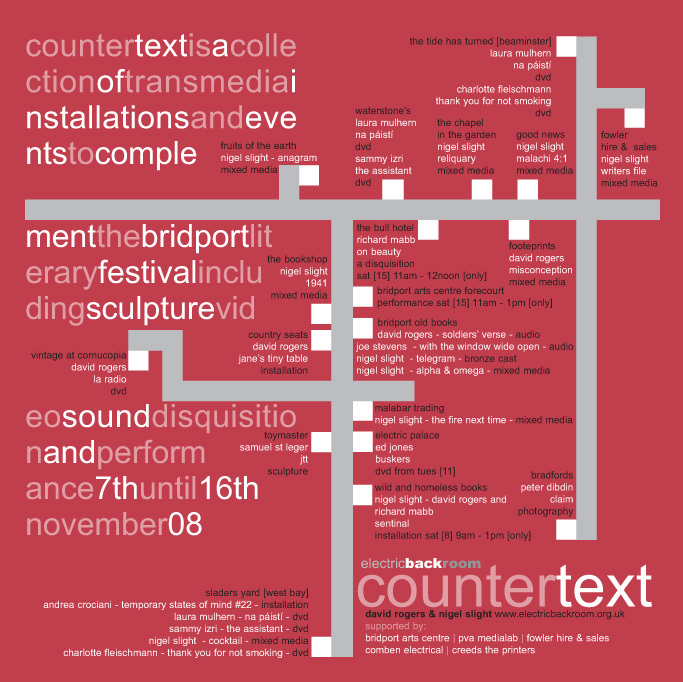 I apologize for being unable to tell you about all the other wonderful installations, or for anything I have misconstrued, for I just dipped into ‘countertext’ but I wish I had been submerged.